As students returned to campus last week, many of them were greeted with a new sight: brand new completed construction just past the university bookstore. 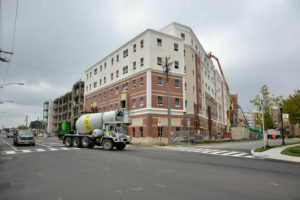 As part of the new development on Rowan Boulevard, part of the A-3 unit of construction opened Aug. 23 and contains class space for the College of Communication and Creative Arts as well as residential space and a brand new fitness center for Rowan students. Contained in the A-3 complex is the recently opened 230 Victoria Street, as well as the Mick Drive parking garage and 223 West High Street. These three structures will be joined by Park Place South, a soon to be opened four-story residential and shopping area. But for students heading down to the new development, one of the main draws is the new recreational fitness center. Dan Scripter, the assistant director of fitness services at the center said that the new exercise space on the ground floor of the Victoria Street location was intended to improve one specific aspect of student life on that side of campus. “We wanted to make things easier and more accessible for students, and especially since they’re moving to these apartments we want to be a centralized location,” Scripter said. Niko McCardle is one of the students using the new fitness center. And for the senior public relations and advertising major, convenience is the best thing in his opinion about the new construction. This entry was posted in News on September 12, 2017 by Kathy Ward.